Many of us probably feel we know what rural means. Perhaps when we hear the word we think of green fields, or wild mountains, or deserted beaches. Or maybe we think of small villages, modern bungalows or just anywhere beyond ‘the big smoke’. Arguably all of these are or can be considered rural and, indeed, in most situations it is not important how we define rural. We know what it is, we use our mental definition, we even have casual conversations where everyone is talking about a different ‘rural’ and for the most part that doesn’t matter. But is does matter when we come to make policy for rural places and when we think what should be included in ‘rural policy’, because the kind of policy we make and the kind of issues we address are strongly influenced by what we define as rural. If we think of rural as fields and pastures then we may think of rural policy as agricultural policy, and if we think of it as market towns and pretty villages we may see it as a heritage or cultural issue and when we think of rural dwellers we have to think about how different policies affect people. The question of how we define rural for policy purposes and in relation to people rather than based on landscapes or places has not been resolved in Ireland. While the OECD uses a definition relating to population density, the CSO defines the rural population as those living outside settlements of 1,500 people, while CEDRA (the Commission for the Economic Development of Rural Areas) defined rural as those areas outside the administrative boundaries of the five main cities (Dublin, Cork, Limerick, Galway and Waterford). That definition includes some large urban settlements like Ennis, Dundalk and Kilkenny. Realising our Rural Potential- the Action Plan for Rural Development refers to the CEDRA definition and provides a map of population densities but does not specify a definition of rural. Finally, and most recently, the new Draft National Planning Framework (NPF) Ireland 2040- Our Plan defines rural as all areas outside towns of 10,000, unless they are within the immediate or ‘metropolitan’ catchment of a city. How we define rural impacts on how many people we are considering when we make rural policy. Is it a minority, niche policy, or something relevant to a majority of the population? With the different definitions we get a very different population groups. Under the OECD definition (a variation of which is used by Eurostat) 70.5% of the state population is predominantly rural. Ireland is the most rural of the EU27 countries for both population and land area (for more information see note 1 below). 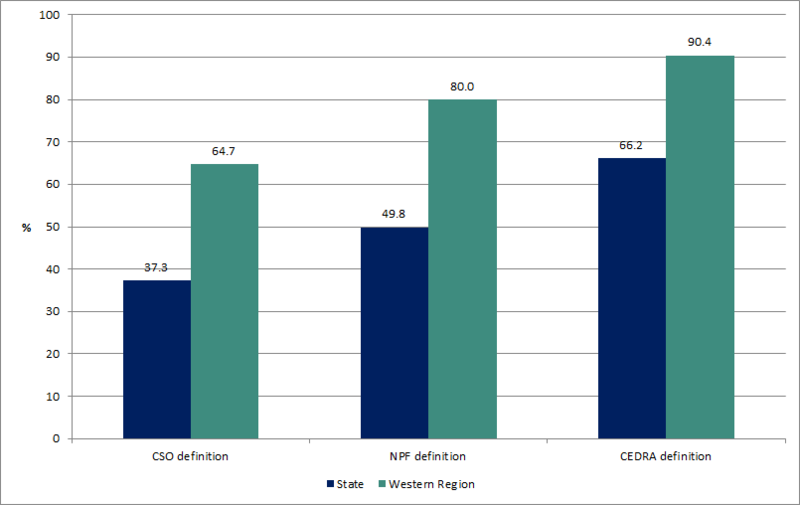 Looking at the different definitions used in Irish policy making (by the CSO, CEDRA and the NPF), for both the state as a whole and the Western Region we can see significant differences in the proportion of the population which is rural. The Western Region is a very rural region and, whichever definition is used, the majority of the Region’s population falls into that category. The CSO has the narrowest definition, with fewest defined as rural people (65%, or 535,953 people in the Western Region) while the CEDRA definition is inevitably the broadest, including on two thirds of the population of thewhole state (90% of the people in the Western Region). Nationally the definition of rural can take in anything between 37% and 66% of the population (between 1.8 and 3.1m people). Looking at what is defined as rural in the three Regional Assembly Areas, which are important policy regions in the NPF and forthcoming Regional Spatial and Economic Strategies (to be developed by the Regional Assemblies) there is a clear contrast among the regions. 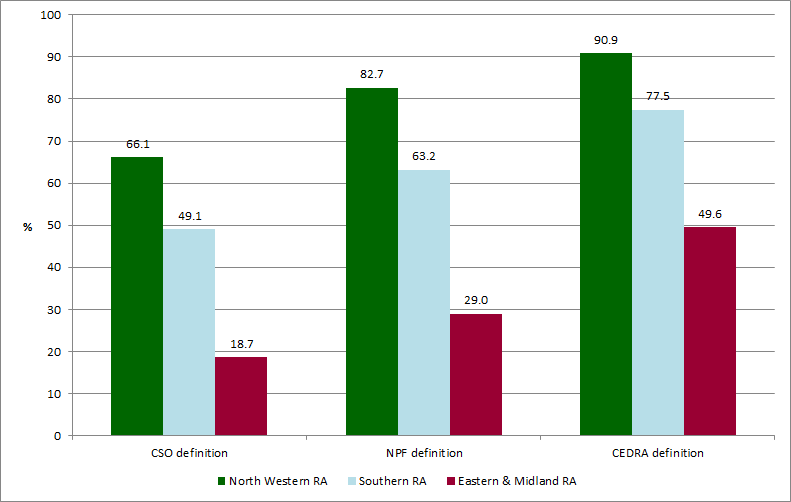 The NWRA is the most rural, with at least two thirds of its population classified as rural in the narrowest definition. The EMRA, even using the broadest definition, has less than half its population defined as rural. Rural Policy or Policy for Rural People? Given the rural population numbers, whichever definition is used, most policy affecting the Western Region is rural policy as it impacts on the majority of the population. Even policy which focuses more on Galway and the larger towns has important effects on rural people as these are centres of employment, enterprise education and health services. Clearly areas which are very peripheral and which have small populations have particular policy requirements but most people in rural areas, however they are defined, have the same needs for employment, healthcare, education and transport as the rest of the population. It is therefore not only important to consider how we define rural but why we are doing so, and how these definitions can be used to ensure people throughout the Region and the country have their needs addressed equally. These catchments are not mapped in the draft NPF and it is not clear how much of the country is considered to be within the influence of a city. https://www.wdc.ie/wp-content/uploads/infographic-feat-image.jpg 170 1051 WDC https://www.wdc.ie/wp-content/uploads/wdc-567.png WDC2017-10-06 09:07:432017-10-05 17:25:13What is Rural? Self-employment – What does the Census tell us? What’s happening in our regional economies? Growth and change in Regional GVA.